Subaru do Motorsport team will campaign a fourth consecutive CAMS Australian Rally Championship (ARC) in 2019, partnering with a new provider. After Championship-winning success with Les Walkden Rallying (LWR) in 2016, followed by second place in 2017 and fourth in 2018, Subaru will partner with Craig Brooks' Burnie-based Orange Motorsport Engineering for 2019. LWR will continue its long and respected association with the sport, preparing vehicles including Subaru WRX STIs, at its Launceston workshop. Subaru driver Molly Taylor will again pair with co-driver Malcolm Read in a Production Rally Car (PRC) class All-Wheel Drive WRX STI. Subaru Australia Managing Director, Colin Christie, said: "We've had a fantastic three years with LWR, spearheaded, of course, by Les Walkden, who has brought so much to the sport - and of course Subaru - over several decades. "We now look forward to continued success with Craig's team. It's a hugely competitive landscape since the advent of lightweight high-speed AP4 and R5 rally cars in the Championship, but we figure we can give them a good run for their money this year, which will make it a gripping contest all round – great for the series and fans alike." Molly Taylor said: "We can't thank Les enough for all that we've achieved over the last three years and, of course, winning the Championship in our first year, in 2016, was fantastic and will forever remain a highlight of my career. "Les and the LWR crew were an integral part of that success and we've been privileged to work with them." She added: "Equally, we look forward to working with Craig and his operation to challenge for the championship in a highly competitive field. "Tasmanian-based teams have the ingredients to reach the heights, so we'll be aiming for the stars." 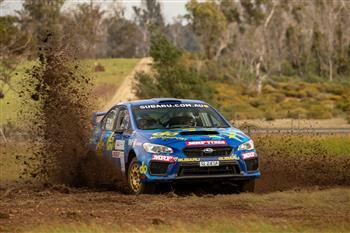 The six-round CAMS ARC gets underway in the first week of April with the Forest Rally, Western Australia.